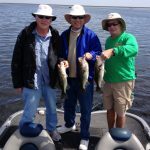 I was fishing for Bass Online I had a great group today! They were very fun even when the fishing was not. The head ring leader was John Manoney, a Hartford CT. Fireman Retired. These big time golfers wanted to break things up and go fishing but it was the wrong day to do this. The water temp in morning was 59 degrees and mostly clear in afternoon. The water temp rose to 64 degrees.